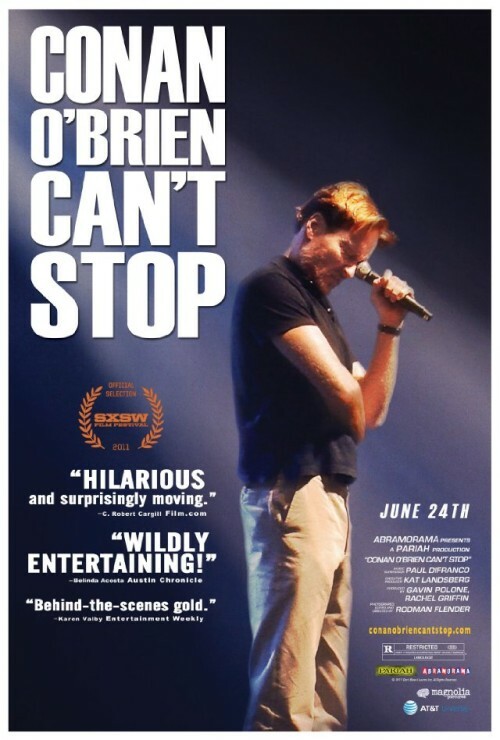 Conan O’Brien Can’t Stop — but the documentary should have. I’m really confused by this rash of documentaries about exceptional people doing exceptional things but somehow the story can’t be told exceptionally. I like Conan. I get his humor. He’s someone to admire – valedictorian, Harvard grad, president of the National Lampoon while at Harvard, Emmy-winning writer while on staff at Saturday Night Live, while writing for The Simpsons created the episode “Marge vs. the Monorail” (one of my favs), then went on to late-night, which is what he is most known for. Then he gets hired by NBC to host The Tonight Show. Then gets fired for very suspect reasons. NBC pays a lot of money. Conan is not allowed to be funny for a certain period of time — at least on TV. So, he sets up the Legally Prohibited From Being Funny On Television Tour. The filmmakers however, make the documentary like a video log of the events. While interesting — as Conan always is — the film never drills into an underlying theme. It takes on the “this is what happened” mode of storytelling rather than the “this is what it means” tactic. Two very different things; and something that many documentarians lately (see American: The Bill Hicks Story) seem to be missing. The events themselves are not compelling in an amongst themselves. They must be structured in a compelling way. If you like Conan, its an interesting look into his process. It’s funny because he’s funny. But, I wouldn’t expect to be moved by it. I mean, he’s a successful celebrity who was wronged, but was able to move on and become…. a successful celebrity. Not much of an arc.